Giddy. That's what I am. 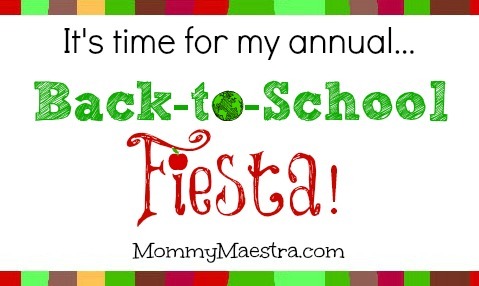 Or maybe just plain loca because my annual Back-to-School Fiesta! week this year has turned into a MONTH of giveaways. Now you probably have noticed that I've been doing less and less giveaways lately. Mainly because there's so much time and work that goes into them and I've been stretched thin. But this is the one time of year when I know MommyMaestra readers deserve the chance to win some awesome educational items to help boost their children's education. So we're starting off with an awesome Spanish curriculum! 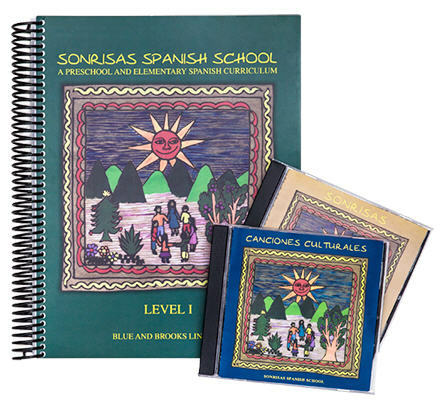 One MommyMaestra reader will win a Level 1 Curriculum from Sonrisas. This is an amazing 2-year program for kids in Pre-K through 5th grade. There is a heavy emphasis on culture and a strong literature component to it. You can read my full review here and decide if this sounds like the right curriculum for your children/students. The Level 1 Curriculum comes with one Teacher’s Guide and two CDs; one with Spanish songs, poems and chants for children to accompany the lessons, and the other with cultural songs. It has a retail value of $189.00. As a childcare provider, I'd love to win this! I'd love to share this with my kids and our school! I've been looking for a way to really get my daughters to speak and read Spanish. I came to the conclusion that I really need a curriculum to help me do this. This way I can set time dedicated to learning Spanish and emphasize on our culture. I would love to use this! I have 2 little ones of my own that are learning Spanish, as well as International Students that I tutor in Spanish that would really benefit from this:)!! Me gustaría compartirlo con la escuela de mis hijos. ¡Gracias por la oportunidad a ganar! Wow! This is a great giveaway! Gracias! What a great giveaway! I have never heard of this curriculum and would LOVE to try it out for my kiddos! My daughter is entering 1st Grade in a Dual Immersion program and this would help me to work with her at home. What a great program! I think this would be a great curriculum for both my six and nine year olds. As others have mentioned, we so appreciate the great resources you provide us with. Thanks again! It would be awesome if I win. After researching lots of Spanish curriculum programs, Sonrisas level I is the one I need. Thanks for sharing! I have a 4 year old preschooler whom I immerse into the Spanish language any chance I get. She is being raised bilingual and I would love to be able to use this curriculum to aide us in the process. I also have a 7 month old who would also benefit from this curriculum. Thank you for this opportunity. This would be AWESOME to win!! I am teaching K-5 Spanish with very limited resources and would LOVE to use this!! I am always on the search to find different ways to improve and spice up what I do. Thanks for the chance! This material would be perfect for me. Hope I can win it! I want the kids to learn Spanish. I would love a ready made curriculum for Spanish. I've been trying to come up with one of my own but its not easy! This would really help my son with school. I would like to have my children learn Spanish! This sounds like a wonderful curriculum for my children. Thank you for the opportunity. I have been working on teaching Spanish to all three of my children so this curriculum would be fantástico! We live in an area in California that has many Spanish speakers, so I think it would benefit my son a lot to learn Spanish early in his education. I might even pick up something along the way! This would be great to use in my classroom! I am the sole K-8 Spanish teacher in my Catholic elementary and middle school, and we have no curriculum or books for the kids to use. This looks like an awesome resource! I teach pk3-4 grade Spanish at a Catholic School. We have no curriculum and the 3&4 grade books are old, outdated, torn, and we do not have a complete classroom set. I have researched the Sonrisas curriculum and was blown away with this program. I would love for my students to enjoy Spanish class and the beauty of the language.I would love to see their faces light up with this programs curriculum and its activities. I'd love for my daughter to learn spanish. It would be amazing to win this curriculum!!! My daughter is 4 and I am looking for a Spanish curriculum I could use with her and with our boys once they grow older. I really could use a good curriculum to continue teaching Spanish and its culture to our children. I love this curriculum and I'd love to win it! This looks like an amazing resource! I would love to win it! I would love to win because I am bilingual and would like to get my kids speaking spanish too.